I just bought a 1956 Century Resorter. Great interior, solid bottom, but I really want to refinish the hull. Her deck has teak and the usual white caulking, which needs to be touched up. Where do I start to remove the existing varnish and stain, and do I use a product or orbital sander to get down to the original wood? Am I looking at the process in the correct stages? The bottom solid and is painted with antifouling and will probably get another coat of the copper/bronze antifouling because I like the look it gives the red in the mahogany. Here is a pic of the old gal, "Savvy?" I really want that deep shine so I'll pick up some good quality brushes and start on my transom first. I think that flat surface will be more forgiving (of me) as I sand and use the product. I am ordering 2 quarts, figure I should have more than enough for her hull n transom. I'm going to use a ceramic non porous bowl for the application, and to keep the unused varnish "clean." These warm temps here better hold! Yea, Z Spar "Captain’s Varnish" is an excellent choice, as good a choice as any. I'm not so sure about the sponge. I did once try a sponge with paint, after about five minutes I threw it away and went back to my brush, but that is probably just me not trying hard enough. But then I've never taken to using a roller either. I would be worried about a sponge causing bubbles in the varnish, but I’ve never tried it, so this is just the gut feeling of an old fashioned reactionary. My advice is to go for a good quality, natural bristle brush. But give it a good long soaking in linseed oil and a wash off with turpentine before using it. Anyone want to throw out their choice of Varnish? I'm thinking Z Spar with a sponge? I appreciate your help, and I'll post a few pics in progress. If I have any "hard knocks" I'll post a pic and ask for advice as well. Yea, I would varnish over the painted name if only to protect it from UV light. It would need to be a clear varnish so as not to alter the colors. Thanks for the great guidance, and i understand the block sanding as it keeps an even surface unlike our hands. Now do you do anything special with the final coat of varnish? I will be painting her name on her transom so I presume I would need at least 1 or 2 coats of varnish over that paint? Or just the marine paint alone should be okay? Thanks in advance, I appreciate the expertise. To start with you want to get a ‘fair’ surface and one that is ‘keyed’ to allow the new varnish to adhere well. As she already seems to be pretty ‘fair’, start with a 180 grit or less to key the surface, anything coarser and you run the risk of leaving scratches. As already mentioned, always sand along the direction of the grain but where I said sand by hand, amend that to ‘sanding by hand using a sanding block’. Then clean off all traces of dust. Use a vacuum cleaner and finish off with a ‘tack rag’. Apply the varnish in thin coats with a very light sanding between coats using a 220 grit sand paper. How many coats is up to you, I would think two or three would be more than enough, then top up once or twice a season depending on the amount of time she spends in the sun. If you are going to use a vinyl decal/name that wants to go on last, varnish doesn’t take to vinyl very well. Im gonna go with both your comments.....now what grit(s) do i start with to take the varnish down, and how will i know when she feels right to start adding back the varnish? Do you sand in between varnish layers for that deep shine, or do you continue with layers after it dries and then cut and polish with a fine grit? Also I will be painting her name on her transom as the poor old gal has never been named. Do I paint over her perfect varnish or varnish over her painted name? Thank you in advance for the advise. Yes, I would agree she has been well cared for, I am her 3d owner. I believe I will smooth her down and then add a few more layers of varnish and see how well I do with that. I believe Mike gave me some good advice and I agree with you as well, it does her her own personality. 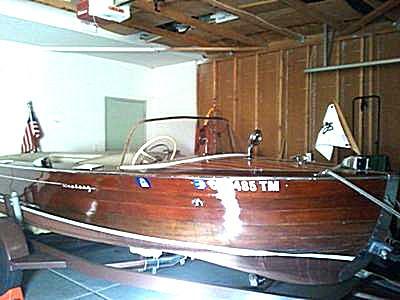 I really just want to enjoy the beauty of a hand made boat and an era gone by. I can just about see the difference in the staining you are worried about. Perhaps the photo doesn’t show it up too well. But to me that is one of the beauties of an old boat, the slight imperfections that add character to an otherwise well cared for beautiful, old lady. Hi Mike, yes Lake Tahoe is very strictly regulated, so the bottom paint will need to comply. Im looking for a product that comes close that will still keep her in Lake Tahoe. Im not sure if the photo really shows my reason for taking her down to bare wood....you can see about a foot back from the cutwater that her stain is a different color, not a big deal but I know it is there. The plank has not been replaced it just looks as if someone forgot to finish puting the stain claear back to the transom. Portside does not appear to have the same issue, but the direct sunlight does not hit her there in the garage. I think your idea of taking the finish down and then adding back with a good cut n polish may be what needs to happen this winter. She has not been in water for 6 years, but registered up thru 2009 with the intention of floating her. Her bottom is great, but with winter fast approaching here in Nevada, I dont want to soak her and deal with having to then winterize. I would like to get her cosmetics finished this winter and then take care of her mechanically in the warm weather. She needs a water pump impeller replaced and carb tune for this elevation so some new needles are needed and some adjusting. I have finished antique furniture, and have found that I handle an orbital sander better than a belt sander, it's a girl thing. haha. I think I will work with what I have as you said, and then if cosmetics really bother me I will eventually do her whole hull. Now what do you typically use to remove and the product to replace her dried white caulking on her deck? Thank you again for your willingness to help. First, before you go buying any antifouling just make sure that the copper variety is still legal in your area. Yea, I agree it does look good against the mahogany, but the bureaucrats have found a nice soft target that make it ‘look as though’ they are addressing environmental issues, as a result copper in bottom paints are gradually being banned in many locations. Now as for the varnish, she looks really good in the photo. Do you really need to strip the varnish back? Or would a rub down with fine grit and a couple of top up coats of varnish (with UV filters) do? If you do need to get it off (the varnish that is) I personally would avoid using any chemical paint strippers, horrible nasty things and they can work out expensive. And I would and be wary of using heat, as some of the old fashioned varnishes can react in funny ways and you don’t want scorch marks on the wood. Sanding wood prior to varnishing should always be done in the direction of the grain, so in theory, a belt sander would be ideal, however they need to be used very lightly or they can take off more than you bargained for. If you already have an orbital sander, use that to get the majority off and perhaps use a scraper for any stubborn patches. Then finish off by hand sanding along the direction of the grain. Work down to a very fine grit sandpaper or even cabinet scrapers. And remember the old adage, the more time you spend on the preparation the better will be the finish.